Mahalo for attending the 2018 Pacific Water Conference! 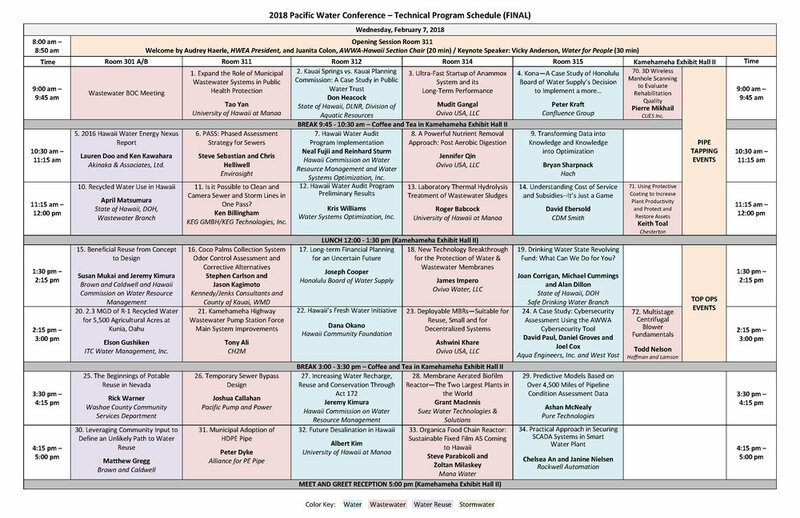 The American Water Works Association Hawai‘i Section and the Hawai‘i Water Environment Association are proud to announce the fifth annual joint conference now known as the Pacific Water Conference at the Hawai‘i Convention Center from February 7-8, 2018. If you have any questions, please feel free to contact the 2018 Pacific Water Conference Chairs at pacificwatercon@gmail.com. Final 2018 Technical Program found below or via this link. If you have any questions, please email pwc.technical@gmail.com or contact Mark Ohigashi (mohigashi@brwncald.com) or Dr. Roger Babcock (rbabcock@hawaii.edu). Registration closed on Friday, January 26, 2018. Please see the Conference Donations Flyer. Contact Contributions committee, Jay Stone (808-521-5361) or Keith Faufata (808-628‐1534), at pwchidonations@gmail.com for more information. This year’s conference hotel is the Ala Moana Hotel. There is a conference rate, which can be booked through this link: https://aws.passkey.com/event/49371078/owner/11602/home. The conference golf tournament will be held on Friday, February 9, 2018, at the Kapolei Golf Course. Registration is at 10:00 am with 12:00 pm shotgun start. Format is four person scramble. Check out the Golf Registration Form for the handicaps, additional contests, and sponsorship opportunities. Reserve your spot prior to December 30, 2017. Payments are due by January 5, 2018. If you have any questions, please contact Darnelle Chung at (808) 836-1900 email djc@akinaka.com. The community service event will take place on Saturday, February 10th. More information on the event will be provided later at pacificwaterconference.com.